The Hub: Dangerous Territory is a collection of science fiction by James H. Schmitz, edited by Eric Flint with the assistance of Guy Gordon, compiler of the sporadically online Schmitz Encyclopedia. In addition to a sensuous adventure novel, The Demon Breed, there are nine other items ranging in length from short-story to novella. These all are part of Schmitz's Federation of the Hub series; the collection easily can be enjoyed as an introduction to that series. "The Searcher" opens the collection, a stunning novella; please see the separate review. "Grandpa", a novelet from 1955, is the earliest story here, and has long been a favorite of Schmitz fans. It's an ecology story, foreshadowing "Balanced Ecology", and set on an ocean world as are the two Nile Etland stories, "Trouble Tide" and The Demon Breed. The hero is a fifteen-year-old boy, a junior member of the Colonial Team checking out the new planet. A scary adventure. Outwardly, everyone in the forest appeared to be going about their usual business. There had been a rainfall earlier in the day; and the tumbleweeds had uprooted themselves and were moving about in the bushes, lapping water off the leaves. Ilf had noticed a small one rolling straight toward a waiting slurp and stopped for a moment to watch the slurp catch it. The slurp was of average size, which gave it a tongue-reach of between twelve and fourteen feet, and the tumbleweed was already within range. "A Nice Day for Screaming" is about what spaceships might find in pseudospace (not a horror story). "The Machmen" has altered men — machine-human combinations — attempting a putsch on a remote world. "The Other Likeness" is about alien infiltration of humanity. "Attitudes" describes a clever and nasty attempt to outwit the Federation Overgovernment. When I first read the above four, I rated them as gimmick stories, albeit rather chilling, with inimical villains and scary situations. But the writing is good, and in the large context and long perspective of the Hub series, these little scenarios strike home in a way that at first they hadn't. The Federation of the Hub is vast, sprawling, loosely organized; a freer and more open society than we might expect to survive in a hostile or dangerous-but-indifferent universe. Aliens of unguessable powers, humans as bad as any you've heard of, more-or-less humans who may be good, bad, or both — how can the Federation withstand such challenges? Well, among other qualities, the Federation is smart, tough, and alert. Necessary virtues. And it intends to stay that way. "The Winds of Time" is a novelet of a starship trapped in pseudospace with a cargo that turns out to be deadly. A good adventure. This is a variation on a theme also used, and tuned to perfection, in a portion of Schmitz's masterpiece The Witches of Karres. "Trouble Tide" introduces bioscientist Nile Etland and the ocean world of Nandy-Cline. Schmitz has a feel for the ocean, and for the people who might live in an alien world's ocean and make their living there. Like Robert A. Heinlein's, James Schmitz characters live in their future environments quite matter-of-factly. And like Heinlein's, Schmitz heroines and heroes cope with their challenges. It is a joy to watch them in action. Nile Etland and her boss, Dan Parrol who is manager of the Giard Pharmaceutical Station on Nandy-Cline, have to solve the unexplainable disappearance of most of the sea-beef (adapted hippo-like creatures) from the ocean ranchers under contract to Giard. Which seems like straightforward detection, but "Trouble Tide" is one of the scientifically weirdest of Schmitz's stories. Decide for yourself if the weirdness or the plausibility makes it the more surprising and unsettling. An excellent scientific adventure. The Demon Breed (serialized as The Tuvela) is a lovely novel, Nile Etland rising to the challenge of turning herself into a mysterious Tuvela in an attempt to block an alien invasion of Nandy-Cline. (Illustrated on the cover of this collection.) See the separate review at Troynovant for this novel and more about "Trouble Tide". The earliest of the stories in The Hub: Dangerous Territory first appeared in 1955, the rest from 1962 - 1969; all but one originally in Astounding Science Fiction / Analog, the other in Fantasy & Science Fiction. Baen Books as usual provides complete bibliographic information. Guy Gordon also contributes a list of "recurring Characters in the Hub Series", making it easier for the reader to discover if one of Schmitz's especially likeable or weird (or both) characters appears in another story. 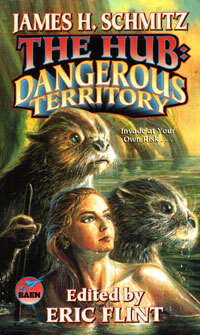 The Hub: Dangerous Territory is an excellent collection. If you haven't yet read any of James H. Schmitz's distinctive science fiction, this book is quite a good place to begin.